Smartphone users aren’t very fond of the notch on the front of many smartphones to hide the selfie camera. Some smartphone makers have turned to using pop-up cameras to eliminate the notch, which may be a better solution for some users. Smartphone maker Vivo is teasing a new smartphone that will launch soon with no notch. The device is called the Vivo V15 Pro, and it has a 32MP pop-up front selfie camera and three cameras on the back. The tease came via an official product video, which can be seen below. The smartphone claims to be the first with a 32MP pop-up front camera. It’s not clear what sensor the camera is using, but XDA Developers speculates the sensor is the Samsung ISOCELL Bright GD1 that was announced recently. Other cool features include an in-display fingerprint sensor, and the outside of the device has a slick looking gradient color pattern. 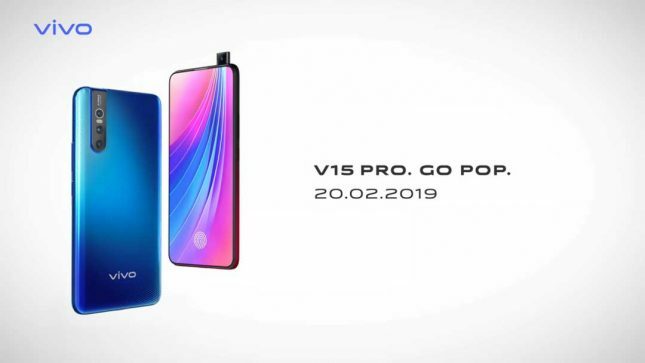 The Vivo V15 Pro will launch on February 20, 2019, in India. It’s unclear if the device will land elsewhere at this time.